Pizza is such an easy recipe to change and suit your needs, toppings can be seasonal or colorful, vegetarian, or full of meat. This pizza is a good combination of both. Originally I made it using just the antipasta vegetables but decided it really needed something else. At Costco they sell very yummy inexpensive rotisserie chicken that I've posted about previously and we had one in our fridge we hadn't used yet. The pesto was also from Costco and bought two bottles when it was on sale so I used on right away and froze the second one. We had just one bottle left in the freezer. I took out the frozen one and thawed in the refrigerator over night before adding to the chicken. If you are looking to change up your Friday night pizza then this is the recipe for you, it's a good blend of flavors. I made a video of myself preparing the pizza and used that in place of the many photos I normally have in a post. Let me know if you prefer the video or photographs for the recipe steps. Warm up water in microwave for 40 seconds. Add yeast to water, salt, honey, and olive oil in a stand mixer mixing bowl. Allow mixture to activate(rest) for 5 minutes. Add flour and blend with dough hook on medium until a smooth ball forms. Place dough in bow greased with olive oil. Allow to rest in refrigerator overnight before using for pizza. Mix pesto with shredded chicken in small bowl, refrigerate while dough rests on counter. Preheat a pizza stone or baking steel in oven set to 525 F for at least 1 hour before baking pizza. Section off a ball of pizza dough and roll it in olive oil on a piece of parchment paper large enough for a 12 inch pizza. Rest for two hours on counter. Press the dough with fingers and use knuckles under dough to stretch the dough into a thin disk with a thicker outer edge. Ladle on sauce in a thin layer leaving the outer inch crust without marinara. 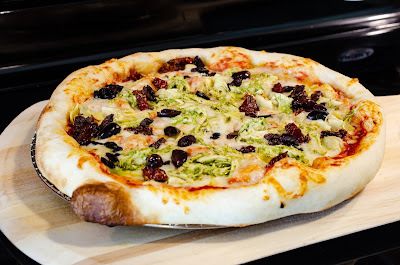 Sprinkle on shredded cheese then the other toppings, ie chicken, kalamata olives, artichoke hearts, and sun dried tomatoes. Using a pizza peel or inverted cookie sheet move the pizza to your stone or steel. Bake for 5-8 minutes or until cheese is bubbly and under carriage of pizza has brown spots. Place pizza on a cooling rack for 3 minutes before slicing.